From listening to music to seeing an ultrasound of a baby in the womb, sounds are all around us and are an integral part of our daily life. Many of the sounds we want to hear – such as speaking with a friend at a restaurant – but other sounds (such as conversations at nearby tables) we want to block. This unwanted sound is referred to as noise, and for many years people have worked to make different types of passive devices (that is, does not require any power to operate) to reduce the noise level we hear, such as earplugs or sound absorbing panels. These types of devices achieve their sound absorbing properties from the materials they are made of, which is traditionally a spongy material made from soft rubbers or fabrics. While effective at absorbing sound, these materials absorb sound equally from every direction, and the acoustic properties of such a material are referred to as isotropic. For applications where the source you are interested in (musicians on stage, friend seated across from you at dinner, etc.) is in one direction, and the source of the noise comes from another direction, these traditional sound absorbers will not discriminate between what you want to hear and what you don’t. Another limitation with traditional sound absorbers is the fact that these sound absorbing materials are visually opaque and cannot be used for transparent applications (which is why most indoor musical performance spaces or recording studios do not have windows). Unfortunately, many of these qualities of sound absorbers are limited by the physical nature of the materials themselves. However, in recent years a new class of materials has been developed for acoustical applications referred to as acoustic metamaterials. Acoustic metamaterials use the acoustic motion of its carefully designed small-scale structure to create a composite material with extreme acoustic properties. These extreme properties are the focus of current research, and are being used to develop novel applications like acoustic cloaking and lenses with super-resolution (beyond the resolution which can be achieved with an ordinary lens). 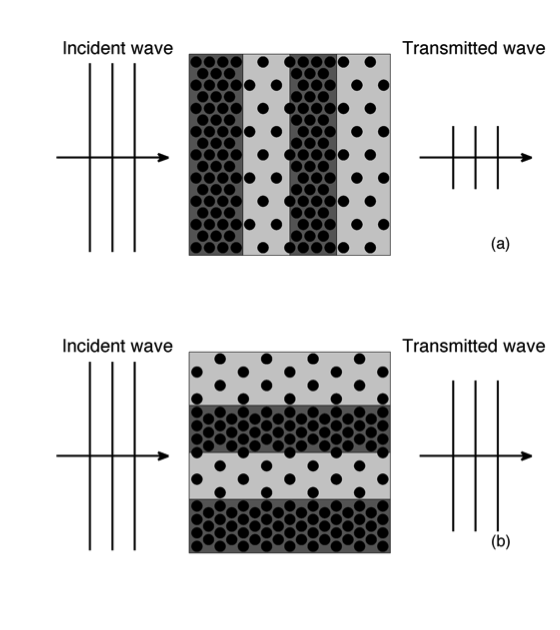 In these applications currently being investigated, acoustic metamaterials have typically been modeled using ideal materials with no losses (and therefore no absorption of sound), with the presence of losses seen as a hindrance to the design. In air, these losses arise from the friction of the air oscillating through the sound absorber. For sound absorber applications, however, accounting for these losses are necessary to absorb the acoustic energy. 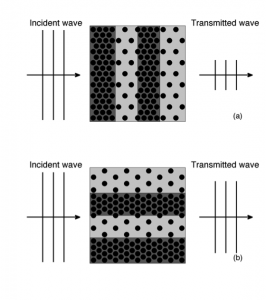 Recently, there has been interest in using the losses within an acoustic metamaterial to make better sound absorbers using resonant structures. These resonant structures, like the ringing of a bell, are excited at a single frequency (tone), and only work over a very limited frequency range in the vicinity of that tone. An alternative approach is the use of sonic crystals, which are a periodic distribution of small, hard rods in air. Sonic crystals by themselves act like an ordinary sound absorber, but can be arranged and designed to create structures with extraordinary acoustic properties. 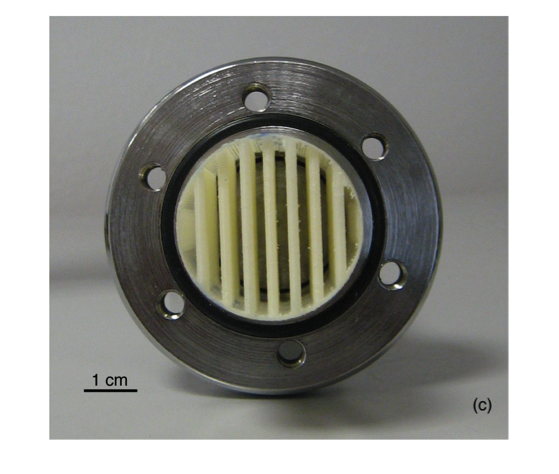 In this work, the use of densely packed sonic crystals was examined to demonstrate its applicability as a sound absorber. Sonic crystal samples were designed, modeled and then fabricated using a 3D printer to be acoustically tested. By varying the size and how densely packed the sonic crystals were, acoustic experimental measurements were made and compared with predicted values. Layered arrangements were designed and fabricated, which demonstrated different sound absorbing properties in different directions and are illustrated in Fig. 1. Fig. 1 An acoustic metamaterial sound absorber made of alternating layers (shaded in gray) with each layer consisting of circular rods (black circles) that (a) absorbs sound in one direction, but (b) lets most of the sound through in the other direction. (c) A photo of a test sample (yellow) fabricated using a commercially available 3D printer.